Early April is a one of the trickiest times of year for the coarse angler. The rivers are closed, and that’s a farce I shall return to, while sport on the stillwaters which remain open fluctuates wildly. Being cold blooded fish are sensitive to temperature change. A rising thermometer will see fish feeding freely. Should it fall then they shut down. Nothing you can do will change that and there’s no magic or secret bait that turns a bad day into a good one. The problem is where I live the air temperature has reached the high teens in the past week but that has been interspersed by frosts. The fish simply don’t know where they are and it’ll take a spell of settled weather to get them feeding confidently. In the next few weeks Stillwater anglers can look forward to catching tench again. Traditionally seen as a summer’s morning or evening fish it has only been since the stillwater closed season was abolished that anglers came to realise how early on in the year they feed. April and May are top tench months, often more productive than June or July. Specimen carp will be having a munch, too. As the season progresses big carp soon wise up to anglers’ baits and rigs. Right now they are catchable and they’re hungry. They’ll be searching for protein so they can produce eggs and spawn. But what of the rivers? This week I was approached by former MP Martin Salter who is now the National Campaigns Coordinator for the Angling Trust. He was seeking my views on the rivers closed season and invited me to write a piece for the Trust web site. The Trust is in a bit of a cleft stick. They are angling’s political voice and our only route to getting the law changed. 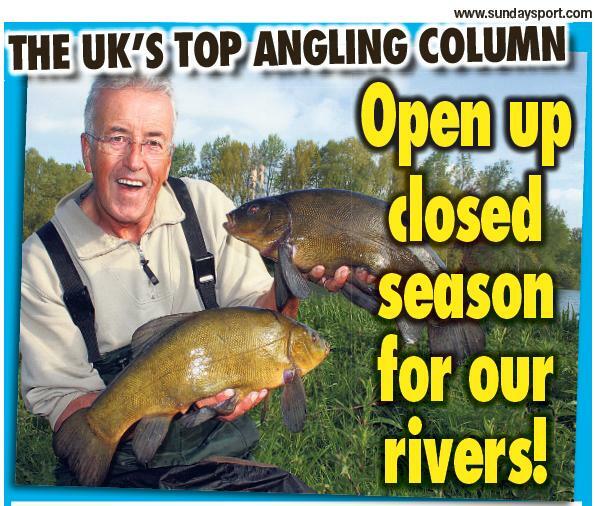 Unfortunately the issue of the closed season splits angling. Traditionalists insist we should retain a closed season citing all manner of reasons, none of which were considered when it was introduced in 1878. They may feel it portrays angling in a good light, makes us appear to care for the environment, it can be used to claim we are conservationists, that we don’t disturb breeding birds and allow the river banks to recover, but deep down inside they love nothing more than to have a rest, put their feet up knowing no-one else is catching the fish they’d like to catch and then they can celebrate opening day. The ‘glorious’ 16th June. Upset that cohort and it’ll affect membership Unfortunately June 16th is not glorious at all. In fact it’s abhorrent. The most commonly targeted species in our rivers have either only just spawned, are actually spawning or they are gathered in readiness to spawn. To target them en-masse on opening day is questionable to say the very least. Meanwhile, right now, we cannot fish our rivers for coarse fish. It’s the closed season. Yet chub and barbel are not spawning. In fact they are possibly in their best condition of the whole year. What’s more, if we were fishing for them we would be providing them with the very high protein foods they need to breed successfully. Where’s the common sense in preventing that? Don’t waste your time looking. There isn’t any! So anglers on the riverbanks will disturb nesting birds. Will they really? How come canoes and cabin cruisers will be sailing up and down, then? And how many folk will be out walking with dogs off their leads? How many will take their kids out in the fresh air, enjoy picnics, ride mountain bikes, quad bikes and various other off-road vehicles? Compare that little lot with the guy who wears camouflage clothing and sits quietly below the skyline, merging into the background. Come on! The least intrusive person by the waterside is the angler. Some of the most memorable highlights of my angling life aren’t those where I catch fish. It’s when a kingfisher has come and sat on my rod. When robins, chaffinches and pied wagtails have fed from my bait box within inches of where I sit. Swans, coots and moorhens are seldom far away either. They know that if I’m fishing it means there’s free food for them. Let’s kill this myth that we disturb nesting birds once and for all. I don’t disagree that birds nest close to where anglers fish but providing we are around in the nest building season they will site their nests just far enough away to feel comfortable and no more. Birds and anglers at the waterside are in harmony. Yes but, these dogmatists respond, the vegetation gets trampled down and needs to recover. Really? Why? So they can come along and flatten it down again on the glorious 16th? That’s utter madness. Where’s the logic in that? The thing is, this call for change is not about abandoning the closed season – anything but. It was originally introduced to keep coarse anglers off the river banks during the salmon season. Back then fishermen ate everything they caught. Times have changed. We carefully return our catches today. Let’s not forget this law was passed a quarter of a Century before Orville and Wright managed to make their first epic flight – all 120 feet of it – and the San Francisco telephone exchange served just 18 phones. Yet here we are in the 21st Century still observing a 93-day closed season that was never based on one single scientific principle or study. The man who introduced the Act wasn’t even an angler. No-one can answer the simple question, why 93 days? It has no basis. It simply exists. The mood for change and the inevitable call for a review will no doubt be based on a shortening of the current dates and a shift in the timing. Many seem to agree that a closed season running from the 1st May until the end of June would make far more sense than what we have now. I know I personally would feel a lot more comfortable with that. What’s more it should appease the traditionalists and maintain angling’s unity. With 8 pools to pick from there’s plenty of room at this prolific Midlands fishery. High Pool is beginning to hit top form with match weights now topping 100lbs. The 35-peg lake is the deepest on the complex holding big chub and barbel as well as hoards of smaller carp and masses of silver fish. The fishery provides disabled access, a tackle shop and cafe. This entry was posted in The Vault and tagged Angling Trust, Martin Salter, River closed season by Bob. Bookmark the permalink. I live in Germany and fish here and often in Holland, both of which do not have a close season, we have ” restricted times” it varies for different fish but in these times you are not allowed to fish for certain breeds, it is a far better system and if you check Holland has some of the best fishing anywhere in Europe. The current close season is a farce, we are allowed to fish canals, lakes and ponds, but not drains, or rivers. I am not sure if the exception granted to the Norfolk Broads at Easter etc. still exists? If so it just proves that the current close season is even more illogical. However it does not change the fact that the existing close season is in need of review and if its retention, if it is remain justified by more than legislation introduced to protect the interests of the trout and salmon in the 19th century. I hope this debate will go forward.